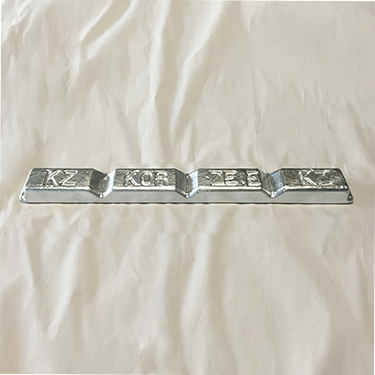 Featuring pure Zn shot for precious metal alloying and other uses; Zn plating anodes; Superdie and other Zn alloys for rubber-mold and permanent mold casting, ultrasonic solders. Special high grade Zn, ACS reagent grade Zn, Zamak die casting alloys, ZA alloys, galvanizing brightener alloys, crusher alloy, slush alloys, plates, and rods. Zinc is used to make many useful alloys. Brass, an alloy of Zinc that contains between 55% and 95% Copper, is among the best known alloys. The use of Brass dates back 2500 years and was widely used by the Romans and is commonly used today, particularly in musical instruments and many hardware applications that must resist corrosion. Zinc is alloyed with Lead and Tin to make solder, a metal with a relatively low melting point used to join electrical components, pipes, and other metallic items. Other Zinc Alloys include Nickel Silver, typewriter metal, and German Silver. Roughly one third of all metallic Zinc produced today is used in galvanizing. Zinc is used as a protective coating to an item that is experiencing corrosion. The Zinc can be applied to the object by dipping the item into a pool of molten Zinc, but most often this is accomplished through electroplating. 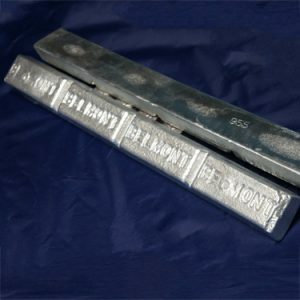 Sacrificial Zinc Anodes are used in cathodic protection systems to protect exposed iron from corrosion. Metallic Zinc is also used for many other applications, including, but not limited to, to make dry cell batteries, roof cladding and die castings. Slab, Waffle, Ingot, Bar, Ball, Cut Pieces, Shot, Mossy. 95/5 Zinc Aluminum M Solder alloy composed of 95% Zinc 5% Aluminum that exhibits remarkable coating corrosion resistance and adhesion. Resistance to corrosion of joints soldered with 95ZN-5AL is superior to that obtainable with other solders; it is comparable to that obtain with pure Zinc. Slush Cast alloy is a high purpose-engineered product. 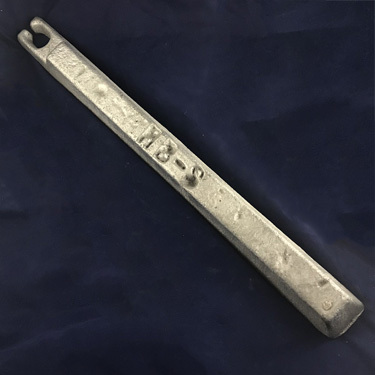 This alloy was developed to provide a high fluidity casting material capable of producing a good surface definition when cast in metal permanent molds or rubber molds. It contains approximately 5% Aluminum and 95% Zinc. It is used primarily for the use of hollow castings. Zinc/Aluminum solder is an alloy of 98% Zinc and 2% Aluminum. Used as a coating sprayed onto steel. Zinc/Aluminum solder 99% Zinc and 1% Aluminum. Used by the Romans and is commonly used today, particularly in musical instruments and many hardware applications that must resist corrosion. Zinc is an alloy with Lead and Tin to make solder, a metal with a relatively low melting point used to join electrical components, pipes and other applications. Commercial Zinc base alloy, it contains approximately 15% Aluminum and 85% Zinc. Specially formulated and metallurgically designed to provide superior casting results in Spin-Casting applications. Zamak 12 offers high hardness and high tensille strenght. This is the preferred alloy for permanent mold applications although it can also be cold-chamber die-cast with excellent results. It combines low temperature melting efficiency and thin wall capabilities with premium mechanical properties. ZA-12 can usually be poured directly into molds designed for aluminum and brass. Zamak 3 is a family of alloys with a base metal of zinc and alloying elements of aluminum, magnesium and copper. It is the most commonly used in Zinc die casting, providing an excellent combination of strenght, ductility. It also provides excellent plating and finishing characteristics. This alloy is the designers first choice for die casting applications and the most widely used in North America. Zamak 7 is a modification of Zamak 3. However, Zamak 7 has higher ductility (for Forming and bending operations) and the highest casting fluidity of the Zamak family. Excibits excellent damping capacity and vibration attenuation in comparison with aluminum die casting alloys.